When I first started growing an interest in makeup, I had no idea how many tools of the trade there would be. Brushes; can't live with them, can't live without them, they are the bane of my life the majority of the time. Who can be bothered to wash them? But similarly, who could apply makeup seamlessly without them? Not me, that's for sure. 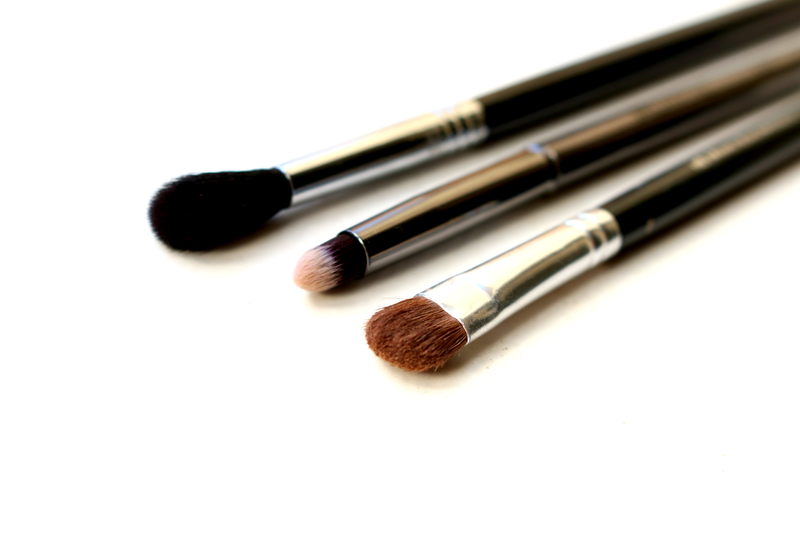 When I first started growing my brush collection I wasn't 100% sure what eye brushes were a necessity, so I wanted to share with you my favourite three brushes for applying eye makeup to guide anyone in a similar mindset to myself back then. 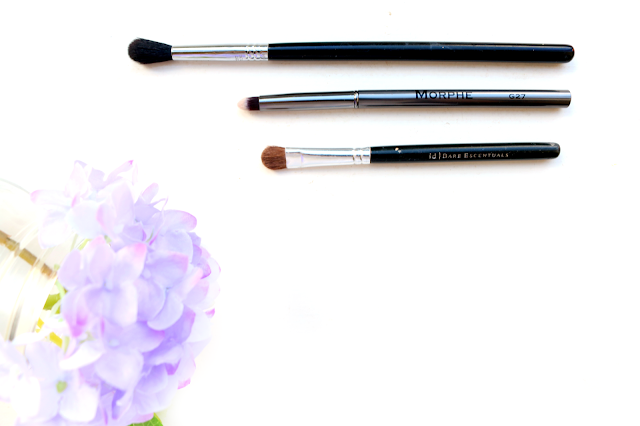 If you only had to have three eye makeup brushes ever, these would be my recommendations. I can't get enough of the appearance of Morphe's Gun Metal brush range; they are so stunning. Before I had a pencil brush in my life I always found things like cut creases and detailing in the inner corner a bit of a faff- these things never ended up as neat or precised as I wanted. A pencil brush is definitely a must have tool for not only for creating detailed looks such as a cut crease but also makes it easy to do the super simple things like highlighting your tear duct; I used to do it with a flat shader brush and make a right old mess! Although Morphe brushes aren't available to buy in UK stores, I use the website Beauty Chamber to order brushes that aren't available in the UK and so far I've been really impressed with it; the delivery is very reasonable and very quick. The majority of Morphe's brushes are really affordable and I would argue they are some of the best quality for money brushes out there- they are just a pain to get hold of if you're in the UK! My old reliable. You've heard all the old sayings "blend, blend and blend some more,"... "When you think you're done blending, you're not, blend some more! ", well this is the brush that makes that possible and quite frankly an easy step in applying eye makeup. I definitely, definitely think a blending brush is a necessity for eye makeup, so out of all three of these brushes if you're thinking to yourself you want to get at least one, I'd recommend the Sigma E40. I adore this brush as I think it's the perfect size for its purpose and is slightly tapered so although it's fairly big it can still get perfectly in the crease. I have heard some people say that the E40 is a tad too large for them and even though I find it perfect a smaller blending brush that I would recommend is the Nanshy Crease Blending Brush which is a bit smaller and flat topped rather than tapered but still does the same job. I can't talk about eye brushes everyone should have without mentioning a standard shadow brush. I absolutely adore this Bare Minerals Eye Shadow Brush for packing colour onto the lid and even shading around the bottom of my eye. I've had this brush for basically forever and it never loses hairs, has lost softness or shape; it's pretty much in as good condition as it was when I first started using it. It's a bit on the fluffy side rather than being a flat brush but I find I prefer that as I can use it to apply and also buff if need be. This brush can also be used wet or dry which means I can spritz it with a bit of Fix Plus to make a shadow appear more vibrant, which makes it a great multitasking product but I would say don't spritz it with Fix Plus then change your mind as it does take its sweet time to dry! I really need to get my hands on some Sigma brushes! I don't own any sigma brushes, but I feel like I really need one in my life! I need to try some Morphe products! I really like Crown Brushes for my eye makeup.